"The story never turns maudlin, thanks to Hammond's clean prose, pitch-perfect dialogue, and keen eye for social detail . . . . Human fallibility runs through this novel, a presence on every page. Hammond also has created a vibrant assortment of secondary characters and meshed them deftly into the plot. 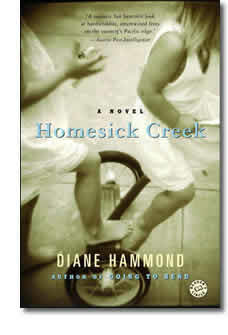 Homesick Creek is an honest, finely nuanced, emotionally rich novel." "Hammond digs into the past, revealing bad decisions and their consequences, desperate acts of courage, kindness that sometimes is not enough to save or redeem. And woven throughout are insights, sprinkled with humor, on marriage and friendship. Homesick Creek is an honest, beautifully written book." "As Hammond nimbly explores her character's inner strengths--and lack thereof--we gradually begin to identify with the mix of gritty determination and tired resignation these people so fully embody." "The novel unfolds with masterly timing and begs full attention, but it is these characters and their relationships that are the core of the novel. The hard-luck tone here might easily have come off as folksy, but Hammond's writing is impeccable, and the characters she has created are as true and lively as they come." Want news about my books? one can give? Hammond tackles this thorny question in her second book about Hubbard, Ore., where the only through street is a highway, work is seasonal and everyone's known each other since forever. The two couples at the heart of this wise, moving novel are diner waitress Bunny and her car salesman husband, Hack, who have more money than love, and Bunny's best friend, the once lovely Anita, and Anita's secretive spouse, Bob, who have more love than money. They're all a good 20 years into their adult lives, plenty long enough to darken their vision of marriage, but not long enough for them to get insight into their own misbehavior. Hammond carefully investigates the good motivations and stark damage fueling her character's self-deceptions, bad decisions and, yes, beautiful gestures, telling her story with spare language and good humor that easily encompasses rich commentary on marital physics. And in that journey comes more than one answer about the test of marriage-witness Anita, who asks for the least and suffers the most. "See?" she tells Bunny. "You think you know all there is to know about someone, and then it turns out you didn't know a damn thing." Publishers Weekly. Copyright © Reed Business Information, a division of Reed Elsevier Inc. All rights reserved. 1. How would you explain Hack's relationship with Bunny's daughter Vinny? How does it compare with the relationship he had with his sister Katy? 2. Bunny feels that her charms, in Hack's eyes, were mainly sexual. Is she right? 3. In what ways do Bunny and Hack look after Anita and Bob? Does their help come from deep affection, or pity? 4. What is Bob's relationship with Warren based on-sexuality, love, weakness? Why is it so important to Bob that it be kept a secret? 5. Does Rae Macy really threaten Bunny and Hack's marriage, as Bunny feared? 6. Why does Hack turn away from Rae when she offers herself to him? 7. Does Bob's decision to hasten Anita's death redeem or damn him? 8. Is Bunny's mother, Shirl, a wise woman or a foolish one? 9. Minna Tallhorse allows Hack and Katy to remain on their own. Is she right to do so, or does she contribute to the events that culminated in Katy's death? 10. Why does Hack decide to get in touch with Minna Tallhorse after so many years? 11. Hack finally tells Bunny about Katy. Why does he keep it secret for so long? 12. In the end, Bunny finds reasons to go on with her marriage. Is her decision one of resolve or weakness? How would you have handled the situation if you were Bunny? 13. Why do Bunny and Hack decide to raise Crystal? Who drives the decision, Hack or Bunny? 14. Is Homesick Creek a love story or a tragedy? 15. In a marriage, are there times when keeping secrets is okay, or is it always wrong? Do you keep secrets from your spouse? Why? I love talking with reading groups and book clubs. If you'd like me to attend your group (including by telephone), just ask!